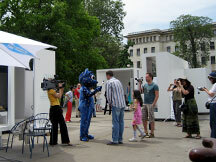 From April to May 2006, the Mobile Studios travelled as a nomadic multimedia platform from Berlin to Belgrade, Bratislava and Budapest to Sofia. The Laznia Center of Contemporary Art in Gdansk provided a Mobile Webcast Studio that transmitted to corresponding issues regularly. 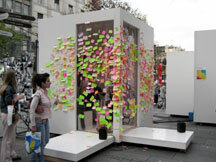 The Mobile Studios are an internationally networked pilot project of a mobile, autonomous production laboratory for young artists, musicians, performers and cultural programmers. 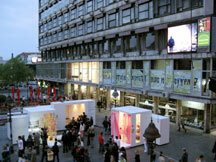 The Mobile Studios settled down at the Republic Square in Belgrade, right in the city center, for one week. Together with the co-producing partner Remont we built up a dynamic live production laboratory, which became a site for public debates, Vito Acconci's stolen chairs, futuristic phone cells, public auctions, individually costumized artworks and much more. 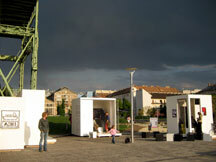 Namestie SNP, the place of the Slovak National Uprising, hosted the Mobile Studios for one week in Bratislava. The Talk Studio offered daily coffee for the employees of the Ministry of Culture and was - as a neutral, nonpolitical ground - a site for lively discussions about cultural needs, future design, Multiplace updates and many more. The digital media hub 13 kubikov, our local curating partner in Bratislava, presented the Mobile Studios within the framework of the Multiplace festival. This week at Millenaris Park in Budapest was an excursion into the protected cultural venue in front of the House of Future - surrounded by flourishing trees, ponds and lawns and a relaxed audience. Many of the projects used the city as a stage: The Miss Europe public investigation took mainly place at Moskva Ter, the GPS workshop sent out participants in different regions of the cities. And the theremin show was performed right next to the studios at the open air auditoriom of Millenaris Park, with a full moon guarding the scene. The Budapest program was produced by our co-producing partners A38 and the curator Edit Blaumann. The Goethe-Institut, InterSpace and brainstoreproject, our partners at the last station Sofia highlighted this mobile communication platform with daily topics like public art, audience development and mediation of art. The daily program was structured in various talk and exhibition formats like "glance through the fence", "wide vista", "Sofia through emotions". Mobile Studios also hosted the The Upgrade! meeting, which presented cultural institutions from the region. A wide range of public and cultural representatives from different institutions exchanged in a lively debate.